If you would like our skate instructors to go to your skate camp/ event, please go to Skate Camps for You link. Robichon’s Kids Skate Camps are the first in the world for inline skates. Approaching its 25th anniversary of running week long and weekend kids skate camps across MN, Robichon’s is now expanding the length of skate camps while also accepting direct registrations. 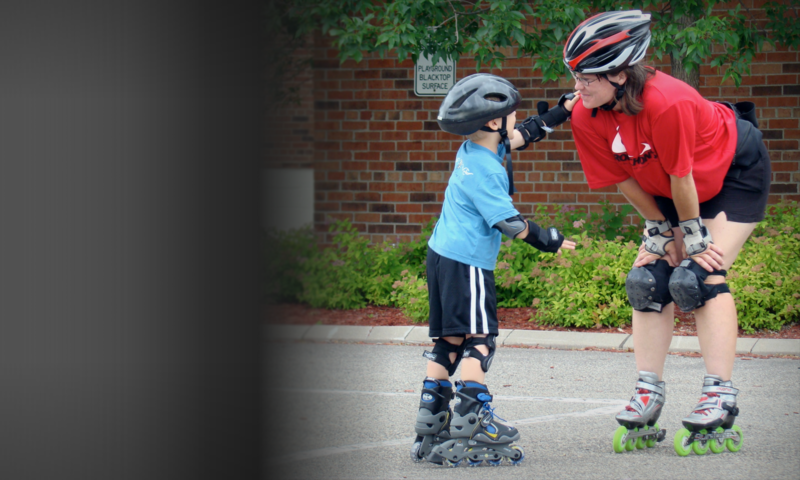 At Centennial Park West in Brooklyn Center, we get your kids learning how to inline skate safely and with fun on the park’s basketball court and local trails. Our skate camp participants return year after year, attend multiple camps and some have become skate instructors with us. We enjoy listening to parents of skate participants sharing dinner time and bedtime stories about what they learn and how fulfilling their inline skate camp experience with us is. Our staff is both volunteer and paid instructors. We have our apprentice skate instruction program which helps teach students how to be a Robichon Skate Instructor. By taking our camps, they learn the necessary skate skills to become a skate instructor with us. Our kids skate camps are appropriate for ages six years of age and older, including kids who are brand new beginners, advanced beginners and intermediates. We recommend our advanced skaters specialize in sport specific courses; such as, speed, street/ramp, freestyle, roller hockey and/or skate trips but we can take advanced skaters in our camps. In order to keep our skate camp pricing low, we do not offer refunds, transfer of days, or transfer of camps due to illness. Please ensure you sign up for the camp week which works best for you and your family. Reducing administrative challenges helps our skate camps thrive. Thank you in advance for your assistance with efficiency. Skate camp run Saturday and Sunday from 12:30 AM to 3:30 PM. June 15 and June 16, 2019.